Preppy Pink Crocodile: Baptism Gift? I am attending my first baptism in less than two weeks. Well, let me clarify. I have watched hundreds of baptisms take place in church over my lifetime. Cute baby dressed up in fancier clothes than any baby should have to be dressed in, a few family member or friends holding the baby and a dad or uncle taking pictures. But this is the first time that I have been formally invited to a baptism. It's not protestant either so I am a little excited to see what it entails. I am used to the minister holding the baby for a few minutes and dripping a few small drops of holy water on the baby's head while holding the baby over the baptismal font. I assume a Catholic baptism will be similar. Only longer. More ritual stuff. At bestie's church they dunk you in a pool of water. I cannot imagine going to church knowing you will have to blow dry your hair before you leave the building. That sort of freaks me out a little. I mean no offense by that- it is just not something I have ever seen before. Oh and this particular cousin has a huge family on his mother's side (we are related via our dads) and was struggling to only invite 80 people (as that is the max that can fit at the restaurant for the brunch following the ceremony at church). Only! Anyway, to end this ramble, the point of my email is to ask for suggestions. I have no idea what to get as a gift. My dad thinks I am nuts and that I should just consider this a check-appropriate moment. And I guess a check is always appropriate. But it sure isn't at all fun. Or special. So considering I have less than two weeks to seek out this present, do you have any favorites that you like to give for such an event. It doesn't have to be religious at all- just special. Actually, in my opinion (and this is my blog after all! ), religious items fall into the same category as underwear and bed pillows. They are personal and best left to the individual to buy as they see fit. But I do need a gift so any and all suggestions are welcome! *Update: Bestie gave me the best idea and I used it here and here and many times since then! I also really struggled with this issue with P&G's little ones, since the hub and I are godparents - well he for one and me for the other since we're not Catholic. I was never involved in a church that did infant baptisms, so they've never made much sense to me, so yeah I was like what the heck to get?! Well for the first, we got a Bible. And that turned out to be a bad idea because the kid now could open up his on Bible store. Apparently a few others had the same idea. For #2, I got her a DARLING pair of little shoes. And on the note on the gift I said, "As Kate begins her walk with God, she should do it in a great pair of shoes." Yeah, it was a total hit with the mom and the family. Major brownie points for the godmother!!! A keepsake rosary is a nice gift. My brother & sister in law (also my son's godparents) bought one at the Vatican on their vacation to Italy & gave it to my son as a Christening gift. I seem to remember getting a few keepsake type picture frames at both children's christenings. If there is a Christian bookstore near you, they may have some good ideas. baptism :) I LOVE the cross. Too cute!! 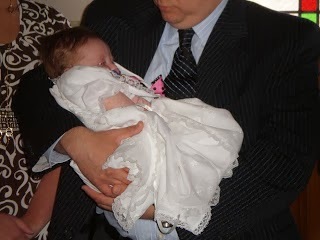 I have never been to Catholic baptism before, but a friend of mine had her son "sprinkled". I bought them a book that they could read to him, explaining baptism and it's importance in a child like manner. Good luck - this is a hard one. We are Catholic and they just poured a little water on my daughter's head, then they rub in chrism (blessed oil, smells good). It does depend on the Church though. A good gift, if they go to church often, are wooden children's rosary beads. They will keep the baby occupied in church! The traditional gift for a baptism is something silver. We usually go to Things Remembered and get a monogrammed item like a silver rattle or box or picture frame. If it is a little girl a silver baby bracelet is nice. I agree, giving a check is a very nice gesture, but you'd like to give something lasting. One standout gift we received for my son's baptism that still hangs on his wall is a calligraphy writing on the significance of his name. Very cool--he'll have it all his life.